Equip your arsenal with these custom memo pads for your promotional event or corporate event! These logo imprinted memo pads make impressive business gifts as everyone finds them scribble friendly and pocket friendly! 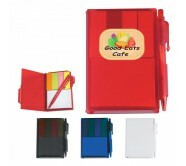 These memo pads will not only keep your brand logo before their eyes but also offer large work space. These pocket-sized notebooks suit everyone with a mission to impress their customers. You can enjoy benefits of fast turnaround time, extremely budget friendly prices, free artwork, free design, free online design proof, secure shopping and 110% price match guarantee. These promotional memo books make great gifts during school events, tradeshows, corporate induction programs, corporate orientation workshops, fundraisers, charity events and many more. Unlike other typical custom notepads, custom printed memo books make great elementary school incentives or summer camp giveaways, too. People love to use them for scribbling quick notes in classrooms, homes and offices wherever necessary. Being handy and light in weight, they can always carry it around. Some marketing studies and surveys suggest that almost 69% of people love to retain usable promotional gifts and it strongly influences their buying decisions. Useful promotional gifts always boost customer loyalty and doubles brand reputation. Big scribble space, differing sheet sizes and 1-2-3-4 color imprints on the durable cover helps to make these memo books a standout in the crowd. 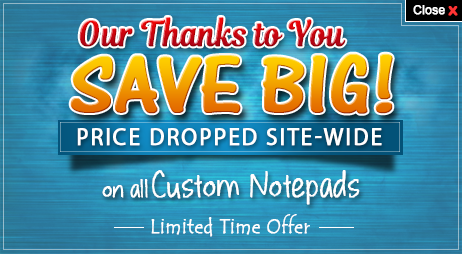 Most of these writing pads are offered with ruled or blank pages and marketers can select them appropriately. Marketers can streamline their preferences depending on their target audience, occasion, budget and others. 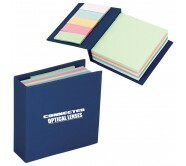 They can impress their customers by distributing any of these customized memo pads on the next available opportunity. To know more about budget prices, print techniques or color choices, feel free to get in touch with our experts at 855-866-8372 or mail us at info@notepadsdirect.com. You can receive these customized memo books anywhere in the contiguous USA.